Government officials in Myanmar’s commercial capital Yangon said Tuesday that they will drop a court case against three jailed journalists accused of committing offenses against the state if the trio issues a written apology in state-owned newspapers. travel to Myanmar “soon” to thrash out a deal for the safe repatriation to Myanmar of the more than 700,000 Rohingya refugees in Bangladesh, Malaysian Foreign Minister Saifuddin Abdullah said Tuesday. A United Nations investigator voiced concern about human rights being sidelined during U.S. and South Korean talks with North Korea over its nuclear and ballistic missile programs, warning on Tuesday: look at what happened in Myanmar. Australia on Tuesday slapped travel and financial sanctions on five top Myanmar military officers, accused of overseeing brutal violence against Rohingya Muslims by units under their command, following similar moves by the European Union and United States. Australia has imposed sanctions and travel bans on five Myanmar military generals accused of leading last year’s violent crackdown on the country’s Rohingya. China and Myanmar are looking into the feasibility of building a railway line from their border to the city of Mandalay, four years after a high-speed project was shelved. The Director-General of the Department of Land Transport, Phirapol Thavornsupacharoen, said on Monday that the passenger van which crashed, killing nine Myanmar migrant workers in Kampahaeng Phet province, was overloaded and its Global Positioning System (GPS) was switched off. The Foreign Secretary of India, Shri Vijay Gokhale, paid an official visit to Myanmar on 22 October 2018. With its army about to be indicted for crimes against humanity, it is shocking that Myanmar’s government continues to violate the rights it so very recently swore to uphold. Last week, with global eyes already on Nay Pyi Taw, the government threw more journalists in jail. Accountability and inclusive dialogue are two important pillars for national reconciliation in Myanmar, an UN envoy has said. Nine migrant workers from Myanmar were burnt beyond recognition after a van they were travelling in hit a tree by the roadside and burst into flames in Kamphaeng Phet province, central Thailand on Sunday (Oct 21) morning. The Myanmar Army and the Karenni National Progressive Party (KNPP) have blamed each other for breaching a bilateral cease-fire agreement during a weekend clash in Hpa Saung township that left no casualties, RFA has reported. Judicial officials in western Myanmar’s Rakhine state declined on Monday to say whether any members of a Muslim militant group responsible for deadly attacks in 2016 and 2017 are among the 747 people that they have sentenced for violating the criminal code and laws related to antiterrorism activities in the restive region. China and Myanmar signed a memorandum of understanding (MoU) on Monday to conduct feasibility study of a railway linking Muse, a border town in Myanmar’s northeastern Shan state, with Mandalay, the country’s second largest city in the north. The Myanmar Army and an ethnic armed group in eastern Myanmar’s Kayah state have blamed each other for breaching a bilateral cease-fire agreement during a weekend clash in Hpa Saung township that left no casualties. A Myanmar Investment Promotion seminar was held on October 16 at Island Shangri-La, Hong Kong. Myanmar Radio and Television (MRTV) and four ethnic media outlets signed an agreement at the MRTV office in Naypyidaw on October 18 to cooperate in the news sector. Boat repair is the main occupation of many residents in a poor township across the Yangon River from downtown and some of them have a precarious existence. Three Rakhine youths have been remanded in custody for two more weeks today after they were arrested on suspicion of involvement in the murder of a corporal from the Military Affairs Security Unit (MASU) in Sittwe, Rakhine State. Ever since the military-backed government of Myanmar embarked on a series of political reforms back in 2011, the country’s political landscape has never been the same. On condition of anonymity, a local resident told the Kantarawaddy Times that the Tatmadaw entered the KNPP-controlled area in Hpasawng Township on October 19 without informing the KNPP. Bangkok-headquartered SLP Environmental has announced the extension of its environmental, health and safety (EHS) compliance auditing services to cover Myanmar, having spent the past year compiling a comprehensive in-house database of the existing and upcoming legislation and statutory guidance relating to EHS performance in the country. 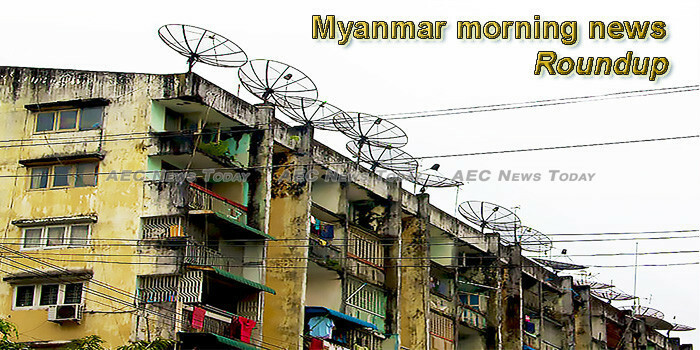 This week’s Myanmar morning news feature photo acknowledges World Development Information Day October 24.